"Brian “Husky” Burnette tried his luck at a number of occupations when he was a younger man. He went to a vocational high school, and a couple of years after graduation, he joined a carpenter’s union. He went to college for a little bit. He even was grandfathered into a sheet metal workers’ union because of his family, but none of them fit quite as right as a guitar does in his hands. “Music’s my trade,” he told The Daily Times this week. “I never thought, ‘OK, I’m gonna do this,’ even though it was something I definitely wanted to do. 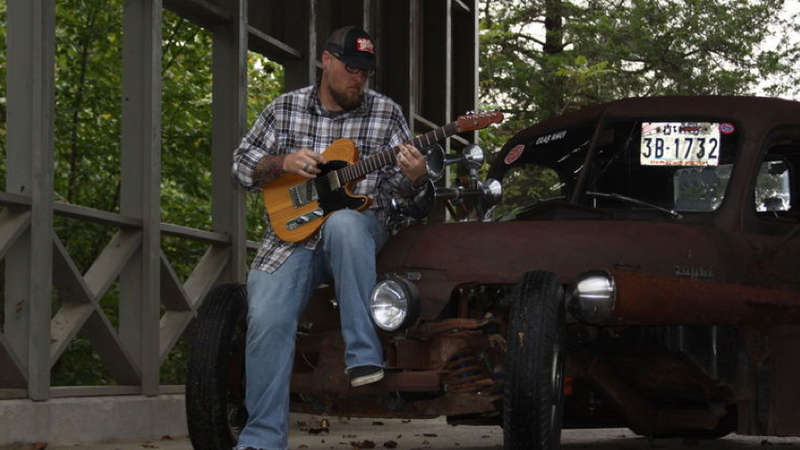 I just don’t know how to do anything else.” Burnette, who performs his particular brand of gut-bucket blues on Friday night at Brackins in downtown Maryville, comes from a musical family. Every member on his dad’s side did something with music, he said, up to and including Johnny Burnette’s Rock and Roll Trio, a rockabilly outfit from Memphis that pioneered the sound around the time that a certain cat named Elvis Presley was starting up. Growing up, Brian played in metal bands, but the blues was never far from his wheelhouse, he said. Those were wild days, he added, and the trouble he got into would provide fodder for his songs on down the road. Although he plays the blues — rough-and-tumble, like Scott H. Biram or the Black Diamond Heavies — he draws a lot of inspiration from singer-songwriters like Guy Clark and Roger Alan Wade, he said. That nickname, though — he’ll be the first to sheepishly admit it’s not exactly the stuff of bare-knuckled legend. It stems from the last band he was in, before he went solo, and he and the rest of the guys were keen to crown one another with unique monikers. The band — Polecat Boogie Revival — did some cool things, however, including touring with Hank 3; as a solo troubadour, Burnette has shared the stage with a number of greats, including Guy Clark, T-Model Ford, Emmylou Harris, Shooter Jennings, J.J. Grey & Mofro and the legendary Leon Russell, for whom he opened a show last summer at “The Shed” at Smoky Mountain Harley-Davidson in Maryville. Burnette, of course, held his own. Now a member of the Rusty Knuckles label stable, he’s still touring on his most recent album, “Tales From East End Blvd.,” riding the roads and playing wherever will have him — preferably in the sorts of sketchy, backwater places where the stage is set behind chicken wire, the floor boards sweat spilled beer and the women smell like cheap perfume and cigarettes, because that’s the sort of environment where his music seems most at home.